As I mentioned in a previous article, Katherine Franke, who also serves as the director of the Center for Gender and Sexuality Law at Columbia University, “claimed that conservatives’ belief in ‘natural law’ is leading to a ‘radical theocratization of the Constitution.’” Not only did our nation’s constitutional founders believe in Natural Law, but many of them believed that the Bible offered guidance on the basics of governance. The claim has also been made that deism was the prevailing theological worldview during the constitutional era. Deism is a philosophical belief system that claims that God exists but is not involved in the world. While God created all things and set the universe in motion, He no longer oversees its operation. Given this definition of deism, which of the founding fathers were deists? Which documents express the fundamental tenets of deism? Official congressional and presidential documents, written before and after the drafting of the Declaration of Independence and Constitution, mention Jesus Christ, sin, the need for forgiveness, and the justice of God. These are neither Natural Law nor deistic proclamations. For example, Pres. 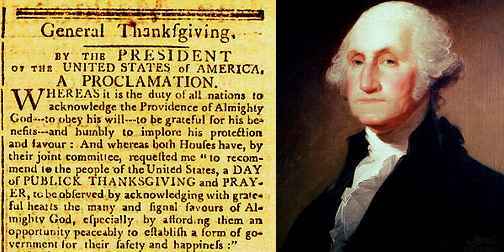 George Washington, at the request of Congress, called for a day of “General Thanksgiving” where the Providence of Almighty God would be recognized and the duty to “obey his will.” The Proclamation was called for soon after the drafting of the First Amendment to the Bill of Rights.